A long sweater + skinny jeans has been my go to lately (see another version here) - but this combo of the J.Crew tunic sweater paired with a perfectly dark pair of Hart denim (with the cute mini cuff) is my favorite. I love it with sneakers & a tote for crossing items off my to do list, or with heels + a glam statement necklace for dinner with my man. As I am craving nothing but basics these days, it is the special little touches that add personality to my outfits. 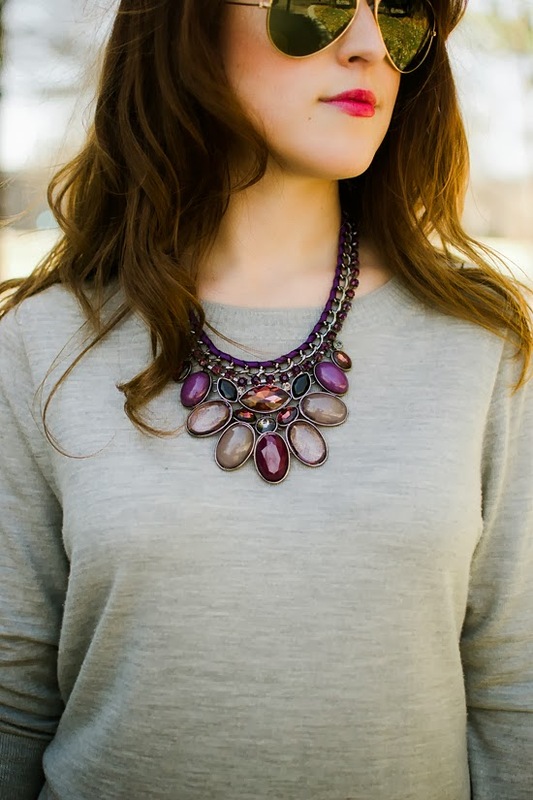 This necklace is seriously stunning in person & I love how it takes a simple gray tunic the next level. Paired with glittery heels, I think it is effortlessly glam! 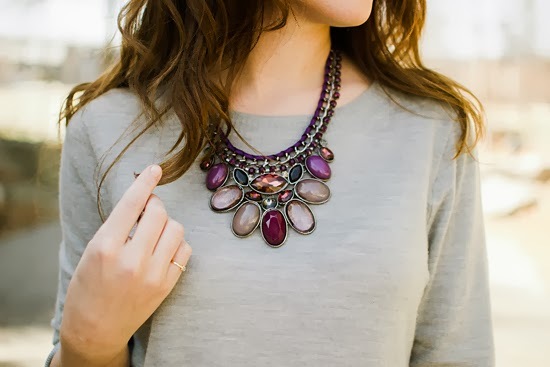 This necklace hails from my new destination for gorgeous jewelry - Total Betty Society. There are SO many great picks, at prices that fit everyone's budget! What pieces help you transform your go to look from day to night? Today Total Betty Society is giving one lucky lady a chance to win this pretty necklace too! And everyone else wins with a 25% off promo code (HereNow25) - which can be combined with the $10 credit you receive when you become a member (required in the giveaway below). Rack. It. Up. P.S. Zipporah & I have been enjoying snapping pictures at some of my favorite Nashville spots. This photo location is Bicentennial Park - a must see for any history buff! This necklace and those heels are just stunning! I want this outfit! It's perfect! That tunic is to die for... I think every girl needs it in her closet!! Love the simplicity of this outfit! Your hair looks gorgeous too. So many things: love the side split in the sweater and the zig zag bag and the heels. Also...HAIR. i love that necklace so much! you look gorgeous! Thank you, I finally threw down $20 for a 1" curling iron & LOVE it! thank you, thank you, thank you… and thank you! 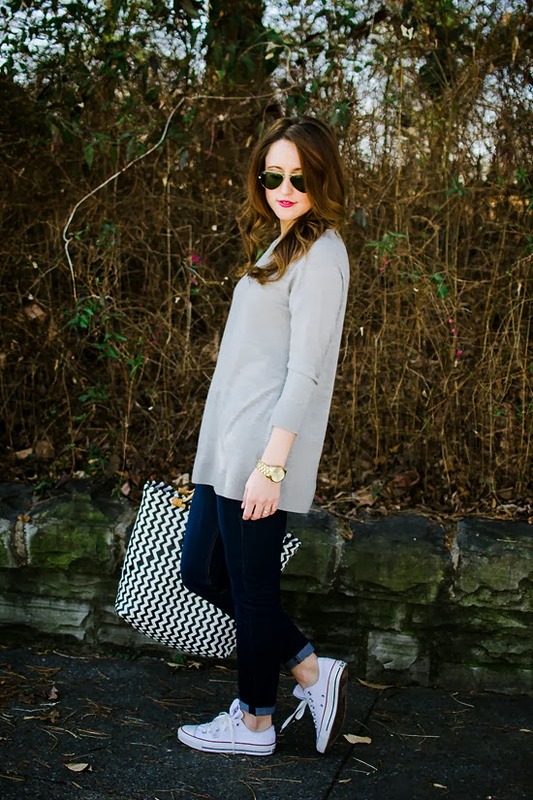 I am loving that chevron tote and your white Converse! 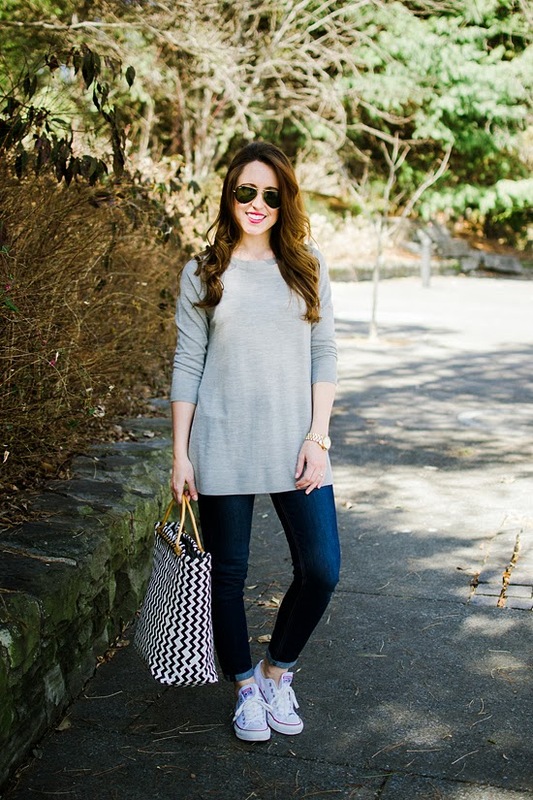 I love both of these outfits - this really is my style to a T (or should I say, tunic! oh, I'm so lame...) That necklace really is great - and I am loving simple converse sneakers this spring! You have me convinced I must move to Nashville because it looks sooo gorgeous! Such a great post! Accessories and shoes really can take an outfit to the next level! I LOVE that tunic and jeans!! you are gorgeous! that sweater is fabulous, i love how you paired it both ways. 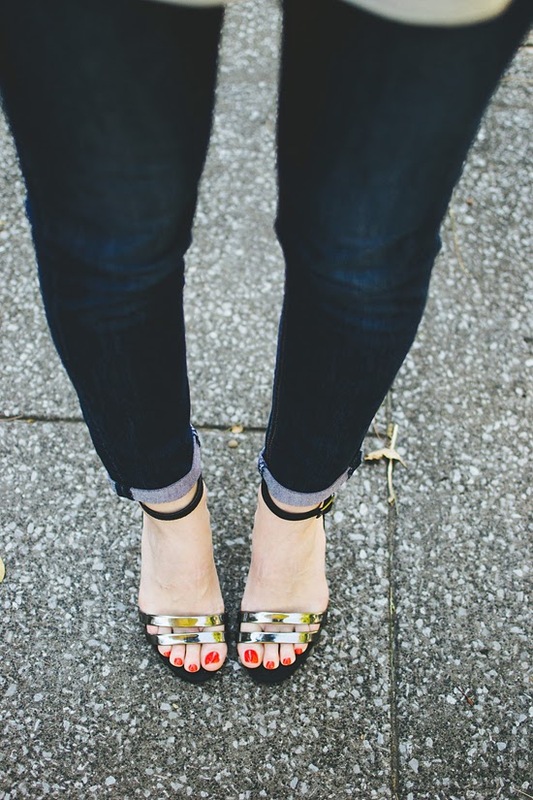 I am a totally jeans & chucks girls too, but a good pair of heels & a statement necklace make all the difference! gorgeous necklace!! and i love that bag! The split on the side of your tunic is so unexpected but totally great! And the necklace - beautiful! Love your hair too, such soft curls. I love these outfits! so cute! LOVE it, maybe it is just because that is exactly my humor, but not lame at all! You must at least visit! It is such a fun & vibrant city, filled with young & wildly creative people! Thank you lady! Pulled out the 1" curling iron, and it yet again proved itself as my most useful hair styling tool!